Explanation: Turning the smoothing modifier on clothing causes the mesh to explode or even disappear. 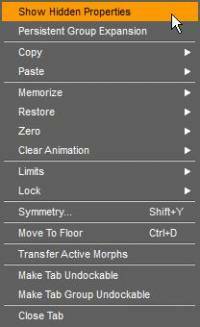 Below are some techniques to troubleshoot issues you may find with Smoothing applied to a model. If you see problems with the mesh exploding or even disappearing, you may want to try the following. Try turning smoothing iterations down to a lower number. The resolution of the mesh will determine how many iterations it needs so sometimes it needs to be adjusted. If there is still a problem, there is something about the mesh that the smoothing modifier doesn't like. 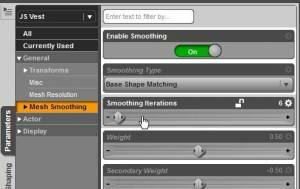 It isn't always easy to figure out what is causing it, so sometimes it is easier to just change the Smoothing Type. 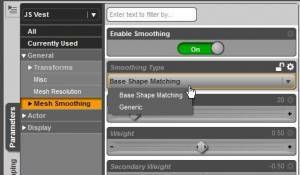 This is a hidden property, so Show Hidden Properties in the Parameters Pane and then change the Smoothing Type from Base Shape Matching to Generic. If your mesh is low-poly, setting it to Generic will sometimes cause pieces of the mesh to change shape more than you want it to. You will need to add some resolution in those places. It is highly advised that you turn the Hidden Properties back off when you are done with this operation.